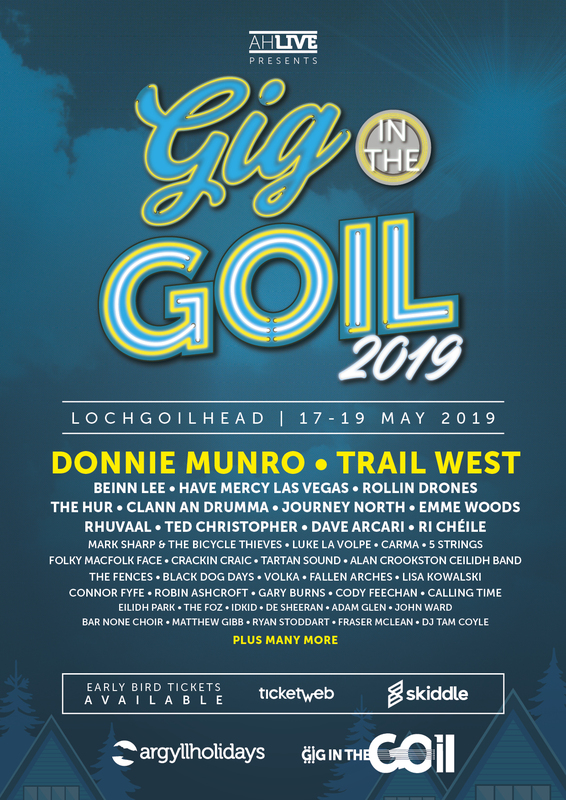 Gig in the Goil is Argyll Holidays' boutique music festival. Returning to Drimsynie Estate from 17th - 19th May 2019, it offers an eclectic range of live music, plus local food & drink produce. Headliners Mànran, Donnie Munro & Trail West are joined by a fantastic selection of Scottish traditional, alternative and acoustic artists over three stages. Enjoy luxury onsite accommodation just minutes' walk from the live music. From cosy caravans and cottages, to luxury hotel rooms and deluxe hot tub lodges, you won't be stuck for somewhere to suit your taste. Even better, we've 3 night breaks from just £55pp. Enjoy a full weekend of the best live Scottish traditional, alternative rock and acoustic music, plus delicious food and drink produce. Tickets are available at an early-bird price until 29th March and they’re sure to go fast so get them before they sell out. Keen to come along to Gig in the Goil but want to find out more information? All booked up to come along but curious about the local area and timings of the event? Check out our FAQ’s for more information and latest updates.